As an example of sustainability, this run-of-river hydroelectric plant will generate renewable energy through the constant flow of water from the Tinguiririca y Azufre rivers. Thus, the environmental impact is reduced to a minimum. 450,000 households will receive power from the 155 MW of installed capacity of this plant and its average annual output of 750 GWh. The water is transported through canals and pipes up to the powerhouse. This has two generating units equipped with vertical turbines. The project included the construction of various structures: powerhouse, valve house, tunnels, intakes etc., which required more than 100,000 concrete cubes. ORMA Vertical Formwork combined with EUC Trusses for 4.8 m high single-sided walls. 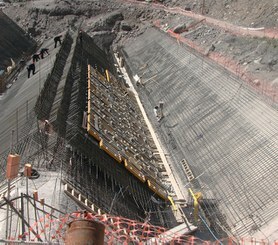 BTM Formwork shored on T-60 Towers, ALUPROP and BRIO Shoring for the pouring of over 1.5 m thick concrete slabs. 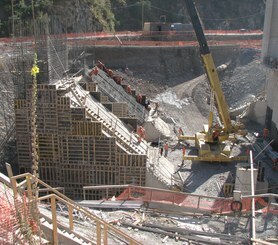 COMAIN, NEVI and BTM Formwork for the construction of vertical and horizontal structural parts. BRIO Modular Scaffolding configured as access staircase to workplaces.